In 2-quart heavy saucepan, heat oil over medium heat to 350°F. In small bowl, mix cream cheese, peanut butter and 2 tablespoons sugar until well blended. Place remaining 1/2 cup sugar on plate. Set aside. Unroll 1 dough sheet on lightly floured work surface; reshape into 12x8-inch rectangle. 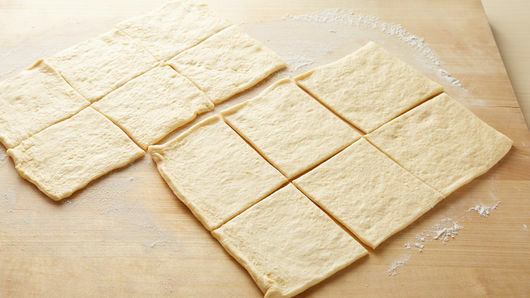 With pizza cutter or sharp knife, cut dough sheet into 6 squares, 4x4-inches each. Repeat with second can of dough. 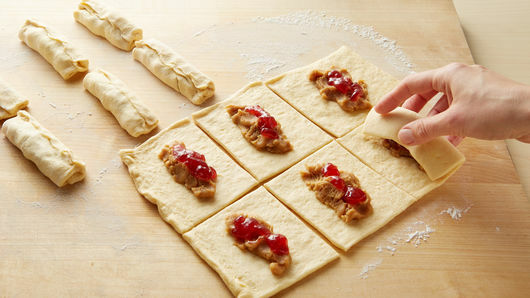 Gently spread generous tablespoon peanut butter filling in center of each square, leaving 1/4-inch edge. Gently spread 1 teaspoon jam on peanut butter filling. For each roll-up, roll side closest to you up over filling, to opposite side. Pinch seam into dough to secure filling in roll-up. Gently place 2 roll-ups in hot oil; fry on one side until golden brown. 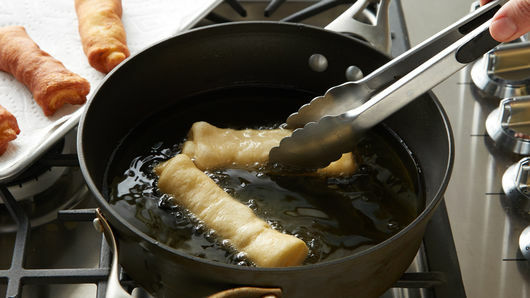 With tongs, gently turn each roll-up over; fry until other side is deep golden brown, about 2 minutes total. Remove roll-ups from oil onto paper towel-lined cookie sheet. Let drain. 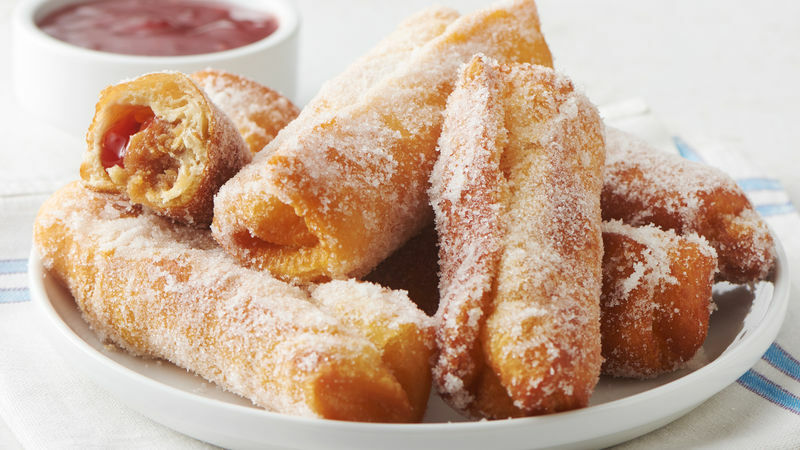 Place roll-ups in sugar on plate, and turn to coat all sides. Remove, and place on cooling rack; cool 10 minutes. When ready to serve, in small microwavable bowl, place remaining 1 cup jam; microwave uncovered on High 10 to 15 seconds or until warmed and able to stir smooth. Serve with roll-ups. To ensure success in this recipe, press together any small dough tears to help prevent filling from leaking during frying. For best results, use a candy thermometer/deep frying thermometer to ensure correct temperature when frying.